El Niño refers to the periodic warming of the eastern equatorial Pacific Ocean that brings sea surface temperatures above average. El Niño conditions, which can last for a year or two, develop concurrently with atmospheric changes leading to a variety of global effects, including drier than normal weather in Indonesia and the Philippines, wetter than normal weather for Peru and Ecuador, a warmer than normal winter for much of the United States and above normal precipitation for the southern tier of the United States. After talking with many of our readers, we at Weather Underground realized there were a lot of myths and misconceptions surrounding this thing called “El Niño.” Below, meteorologist Bob Henson describes some of the most common misconceptions people have about this complex phenomenon. El Niño is just a storm, right? A lot of storminess can happen during an El Niño! But when we refer to “El Niño,” we’re talking about a bigger, longer-lasting phenomenon than just one storm. El Niño refers to a periodic shift in the ocean and atmosphere that pushes west winds and warm water across the tropical Pacific, toward South America. This ocean-atmosphere circulation of El Niño can boost the amount of rain certain regions produce. Because El Niño can last for an entire winter, some places may get more winter storms than usual while others remain drier than usual. Doesn’t El Niño comes every year? El Niño develops about every 2 to 6 years. They usually last one year, sometimes two. A classic El Niño event will intensify during the northern fall, peak in the winter and decrease in the spring. La Niña events behave the same way, except they are more likely than El Niño to last two years instead of just one. When you look across many years, you’ll find El Niño in place about 25% of the time, La Niña about 25% of the time, and “neutral” conditions the other 50% of the time. El Niño just means there will be a bunch of rain. Not always, and not everywhere! El Niño pushes warm water into the eastern tropical Pacific, and this changes where air is rising and sinking across much of the globe. Rising air tends to produce rain and sinking air means dryness. A strong El Niño means a better chance of unusually wet conditions in some places (such as the U.S. Sunbelt, from southern California to Florida) and a better chance of drought in other places (like Australia and Indonesia). The stronger the El Niño, the more likely these effects will happen. El Niño is an “abnormal” event. The eastern tropical Pacific continually oscillates between warmer and cooler conditions, so it’s perfectly normal to get El Niño or La Niña every few years. In fact, one or the other is going on about half of the time. Many people use the term “abnormal” simply because an El Niño event is a divergence from average seasons, which they often classify as “normal.” However, it is not at all unusual or “abnormal” to see an El Niño event. The effects of El Niño can always be accurately predicted. When we look at many El Niños over many years - especially the strong events - we can deduce the kinds of impacts that are most common, such as wetter conditions over the U.S. Sunbelt. But this doesn’t mean that every El Niño event will have the same effect. Each El Niño has its own fingerprint of ocean warming and there are always other weather features in the mix. If El Niño is weak, the usual patterns may not appear at all. It’s best to think of El Niño as raising the odds of some types of weather, rather than guaranteeing what will happen. El Niño is bad news. The effects of El Niño can be helpful or harmful, and sometimes even both in the same place. If you are going through a multi-year drought, any rain or snow produced by El Niño can be a big help. However, if the rain is too heavy there could be flooding and major mudslides. When averaged across the United States, the economic impact of El Niño tends to be positive, largely because of reduced heating bills caused by milder winter temperatures. In other parts of the world, such as Indonesia and Australia, El Niño can lead to fierce drought that reduces hydropower and stunts crops. El Niño episodes are determined by sea surface temperature anomalies at or above the 0.5ºC threshold within the Niño 3.4 region (see right). Every month, the Oceanic Niño Index (ONI) finds the running mean of sea surface temperature anomalies for the past three months (i.e. January-February-March, February-March-April, etc.) When there are five consecutive three-month means that are above normal, NOAA declares it an El Niño episode. Since records began in 1950, there have been 24 years officially classified as El Niño. Each season is further categorized by its strength. Dangerous conditions can’t always be predicted during an El Niño event, so it is important that you and your family are prepared should something happen. The most common hazards during El Niño events consist of flooding, wind damage during strong storms and possible mudslides in the event of heavy rainfall. If you live in an older house, it might be prudent to inspect your roof, or hire a contractor to check for any signs of cracks, holes or loose tiles that could lead to serious leaks during a storm. During any storm, wind damage can cause property damage and personal injury. If you know El Niño is sending a storm your way, make sure you secure all outdoor furniture, or move it indoors. Additionally, rid your yard of sideways trees, dead branches or other loose yard debris that could be picked up by storm winds. Large bare areas could be sources for mudflows during storms. Avoid having these areas in your yard by putting down mulch and vegetating these areas with native plants. If you still have concerns about mudflows or slope stability, plastic sheeting can be placed on slopes and secured with sandbags to prevent erosion. Sandbags can also be used to build a barrier around low areas to prevent flooding. Flooding is one of the most common hazards during an El Niño season. Make sure all of your drains and gutters are clear of debris and function properly to avoid exacerbating flooding issues. If you ever see a storm drain that is damaged or obstructed, be sure to contact your local Department of Public Works right away. The Federal Emergency Management Agency (FEMA) maintains a list of basic supplies that should be included in every family’s emergency kit. View additional information on emergency preparation for businesses, commuters, pet owners, seniors and people with disabilities. Make sure your family has a plan! Use FEMA’s family emergency plan template to create a plan that works for you. You can also find more tips on safety at Weather Underground’s extreme weather preparedness page. Sign up for weather alerts to receive severe weather and forecast alerts via e-mail or text message! The unusually warm waters that El Niño brings to the Central and Eastern Pacific usually leads to well above-average hurricane and typhoon activity, with unusually strong storms. The strongest Eastern Pacific hurricane ever recorded, Category 5 Hurricane Linda, occurred during the strong El Niño year of 1997. Linda had sustained winds up to 185 mph and a central pressure of 902 mb on September 12. In 2015, we saw a record-active Central Pacific hurricane season, and a more active Eastern Pacific hurricane season and Western Pacific typhoon season. The impact of El Niño on weather can often be the most severe in Peru and its surrounding countries. The unusually warm waters commonly cause record-breaking rains along the Pacific Coast of equatorial South America, since warm air holds much more water vapor. The two deadliest floods in Ecuador’s history occurred during strong El Niño events: in November 1982 (307 killed) and during October 1997 (218 killed). Peru’s deadliest flood (518 killed) also occurred during the 1997 El Niño. As reported by AP, a United Nations-backed study said that the 1997 - 1998 El Niño cost Bolivia, Colombia, Ecuador, Peru and Venezuela nearly $11 billion. In July 2015, just before the 2015-2016 El Niño episode began, Peru declared a pre-emptive state of emergency for 14 of its 25 states, appropriating about $70 million for preparedness. Authorities cleared river beds of debris, reinforced river banks with rocks and sandbags and fortified reservoir walls. Thousands of homes were reportedly destroyed in northern Peru by torrential rains in early December 2015. The warm waters off the Pacific coast of Peru during a strong El Niño episode generate a column of rising air over the tropical Eastern Pacific. This air eventually sinks over tropical regions well to the east and the west of the Eastern Pacific to complete a huge circulation cell several thousand miles in diameter. Since sinking air warms and dries as it descends, areas of high pressure and drought tend to form in these sinking air regions. Drought and subsequent fires and smoke in Indonesia sickened thousands of residents during the fall of 2015. The nation ended up suffering $16.1 billion in damage (1.8% of the country’s GDP), which beat the $9.3 billion cost of the 1997-98 fires for most expensive disaster in Indonesia’s history. In Australia, rainfall in the two-month period of September-October 2015 was the third lowest on record, with October recorded as the hottest month ever observed in Australia. Although rainfall improved somewhat near the end of 2015, significant impacts were noted for cool-season crops. According to the U.N.’s Food and Agriculture Organization, dry weather caused by El Niño in late 2015 was responsible for declines of 60% in maize and 80% in beans across the Central American countries of El Salvador, Guatemala, Honduras and Nicaragua. The atmospheric circulation patterns brought on by an El Niño event usually cause much reduced monsoon rains in India. According to EM-DAT, the International Disaster Database, more than 4.2 million people died in India between 1900 - 2014 due to droughts from failed monsoon rains, primarily during El Niño years. El Niño also tends to boost the autumn monsoon across parts of southeast India. Five weeks of frequent torrential monsoon rainfall, fed by record-warm ocean waters during November and early December 2015, inundated southern India and Sri Lanka, killing 386 people and causing at least $4 billion in damage. Hardest hit was Chennai, an urban area of more than 9 million people that was under as much as eight feet of polluted water for days. Check the Dr. Jeff Masters’ Blog to find more of Dr. Masters’ analysis on the global impact of an El Niño episode. During typical, non-El Niño seasons, coastal upwellings pull cold, nutrient-rich waters to the surface as tradewinds push warmer surface waters along the equator from Peru to Indonesia. Upwellings along the west coast of North and South America have the ability to sustain an incredible amount of marine life. In turn, warm waters in Indonesia trigger greater rainfall, allowing for higher crop yields, a pillar of Indonesian economy. However, during an El Niño episode, upwellings diminish severely. Trade winds weaken, warm water stays along the South American coast and rainfall in Indonesia decreases. Fewer upwellings, combined with changes in sea surface temperatures and shifts in rainfall patterns during El Niño, often have negative impacts on the environment. El Niño episodes typically disrupt harvesting seasons, whether that means flooding farmland in South Africa or extreme drought in Australia. Over 59 million people in India were touched by famine when monsoon cycle was disrupted by the 1899-1900 El Niño episode. Over time, erratic rainfall, flooding and drought have all contributed to massive crop failures in Africa, particularly affected sub-Saharan regions. Throughout the 2015-2016 El Niño season, maize production severely declined. Maize is not only a nutritional staple for citizens of sub-Saharan Africa, but it is also the economic center for many communities. South Africa’s harvest was especially impacted by severe drought exacerbated by El Niño. Traditionally an exporter of maize, South Africa had to import more than 300,000 metric tons of maize from Brazil in 2015. Corals turn a solid white when the algae they depend on for life, become stressed and leave. This stress comes from changes in temperature, light or nutrients. During an El Niño event, coral reacts to this shift in ocean temperature by expelling the symbiotic algae that lives within its tissues. Once the algae is expelled, the coral is bleached and vulnerable to other harsh marine conditions. 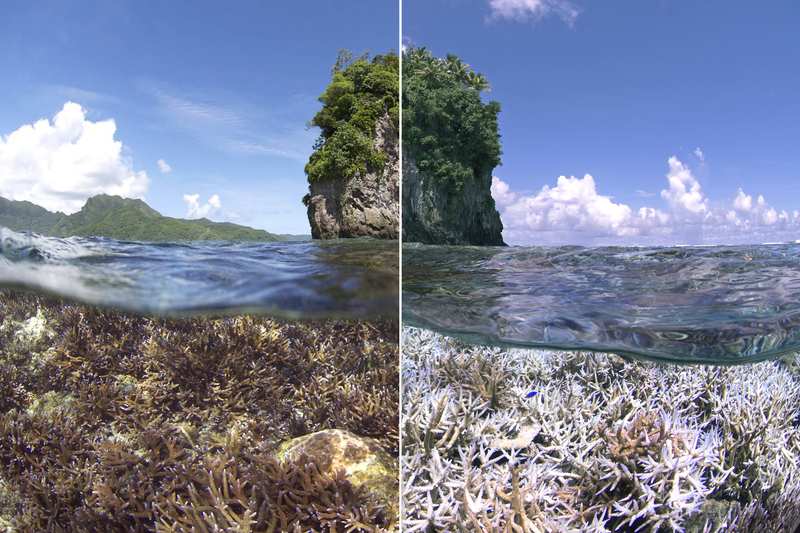 While coral can recover from mild bleaching, severe or long-term bleaching is deadly. Once these corals die off, entire reefs quickly degrade and erode, leaving fewer habitats with shoreline protection for fish and other marine life. The rising sea surface temperature during the 2015-2016 El Niño event endangered large areas of coral in the Hawaiian Islands. Other areas affected include Haiti, the Dominican Republic, Puerto Rico and the U.S. Virgin Islands. Cold, nutrient-rich waters allow for a burst in marine life. However, when waters warm during El Niño episodes nutrient supply goes down, leading to progressively scrawnier plankton and microscopic-like creatures called copepods, the base species for the marine food chain. Normally these plankton and later their predators, the copepods, are very fatty, giving nutrients to larger species on the food chain. In warm waters, upper level marine species are having to migrate long distances to find fattier prey. Ocean sunfish, although tropical by nature, can often be seen off the coast of Alaska during an El Niño event. They migrate north along the Pacific coast, along with many other equatorial fish, in search of more amenable waters. Some species of crab will hide in deeper water, where it is colder and easier for them to survive. Sea lion pups can’t get enough food, leading to a decline in the sea lion population. Jellyfish also have a tendency to die off during El Niño years because of a lack of nutrients. El Niño causes a change in numerous aspects of life, beyond simply temperature and precipitation. Although the worldwide economy is extremely volatile on its own, there is no doubt that a correlation exists between the El Niño phenomenon and price hikes, aid shortages and other new expenses. Commodity prices were rising in late 2015 due to supply shortages caused by El Niño conditions. Whether an agricultural region is getting too much rain, or dry conditions are leading to massive droughts, El Niño episodes tend to bring about massive disruptions in food production, leading to an increase in price for many staples. Over a three week period beginning at the start of September 2015, dairy prices rose by 36%. During that same period, sugar prices rose by 31%, palm oil by 13.1% and wheat by 6.1%. In September 2015, the U.N. Food and Agriculture Organization said that due to higher sugar and dairy prices, overall global food prices rose for the first time in a year and a half. The effects of El Niño on wheat production and pricing are still somewhat contested. Although major wheat-growing areas can be negatively affected by both heavy rains and drought during El Niño, other areas can benefit. Australia’s wheat harvest for 2015 ended up above average, despite very dry conditions related to El Niño in July and September. On January 12, 2016, the U.S. Department of Agriculture noted that global wheat production and global supplies were both at record highs. For several years, the world has slowly been running into a cocoa deficit as demand increases, yet supply dwindles, leading to increased prices on chocolate. During the 2015-2016 El Niño episode, rainfall lessened in countries like Ghana, a heavy producer of cocoa beans, further diminishing supply. Coffee beans also become scarcer during El Niño. As any coffee connoisseur will know, there are two types of beans that can make coffee, and they both face growing challenges during El Niño episodes. The robusta bean can face unusually dry conditions in Southeast Asian locations like Vietnam, while arabica beans grown in East Africa can receive too much rain. El Niño related drought in Brazil severely cut the country’s coffee production in 2015. El Niño may not be bad for everyone. For example, iron ore and coal exports from Australia are actually less likely to be disrupted by severe weather. Normally, mines and shipping terminals have to shut down for days at a time when cyclones hit the country’s coast. This decreases production, slows down shipping and further increases the price of iron and coal. However, El Niño episodes tend to deflect cyclones, which can allow for a steadier production timeline and keep prices from rising. Ever wonder how to teach students about this complicated weather phenomenon? Click on arrows to find lesson plans for all grade levels.